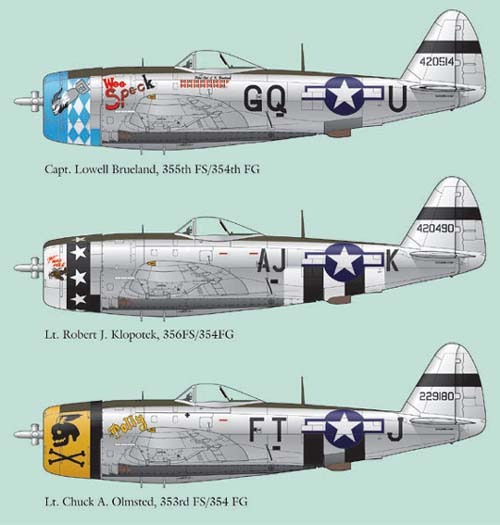 Catalogue Number: Lifelike 72-016 P-47Ds & 72017 P-51s. Contents and Media: Both sets have two sheets, one with the main markings plus the other with stencils, two A4 sized instruction sheets with full colour art-work and a smaller(A5) sheet for stencils all in a zip-lock bag. Advantages: Highly detailed with excellent artwork. Disadvantages: Some of the stencils are a little dark causing flair in the printing process. Conclusion: Lifelike is in the company of that exclusive group that are generally beyond reproach. Lifelike Decals has been around for some time and, along with several other decal producers, are in that group that regularly give us product that is as close to perfection as most modellers would want. These two sets, however, are not quite as good as normal with the smaller stencil sheet being a bit over-done resulting in blurring within the finer markings. Both sets have very nice full colour instructions, a main decal sheet with the individual aircraft markings including enough national insignia for one model and a smaller sheet with all of the stencils. The P-47D set (72-016) covers three aircraft while the other, (72-017), has four. The aircraft in each are as follows. P-47D-30, GQ-U, flown by Capt. Lowell Blueland of the 355th FS, 354th FG at Rosieres-en-Haye, France, Dec. 1944. In over-all bare-metal with an OD anti-glare panel in front of and behind the cockpit, a blue and white nose with a skull/bomb artwork over it and “Wee Speck” in red and black behind. Next is P-47D-30-RE, AJ-K, Flown by Lt. Robert J. Klopotek, 356th FS, 354th FG, same location and time as above. The same bare metal and anti-glare panel as above, white and black nose with white stars on the black and some nose art on the white. There is lower half D-Day stripes on the fuselage although this is not shown on the under-side view. Last is P-47D-28-RA, FT-J, flown by Lt. Chuck A. Olmsted of the 353rd FS, 354th FG, again at Rosieres-en-Haye, 1944. The same bare metal and anti-glare, yellow and black cowling with a black skull and cross bones on the yellow, yellow “Polly” with black outline on the port side and “Double Trouble” artwork to starboard. This aircraft has the black elements only of lower fuselage D-Day stripes. 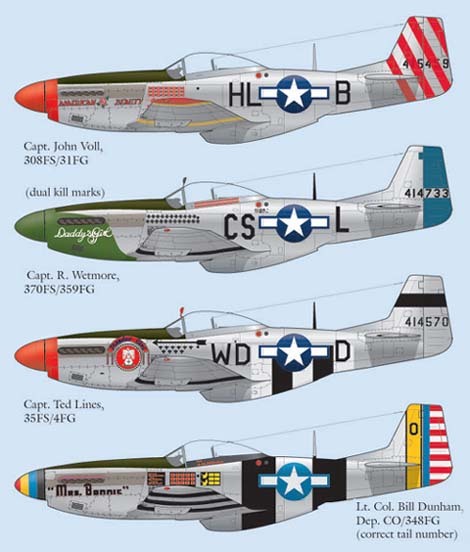 First of all, P-51D-15-NA, HL-B, flown by Capt. John Voll, 308th FS, 31st FG, San Severo, Italy 1944. In bare metal with an OD A/G panel, red spinner and nose with red diagonal stripes on the Fin/Rudder and tail plane. The words “American Beauty” on the port side and “Lovely Lila to starboard in red with black outline. Next is P-51D-10-NA, CS-L, flown by Capt. Raymond Wetmore of the 370th FS, 359th FG, East Wretham, England 1945. Again in bare metal and OD A/G panel, green spinner and nose and blue rudder with “Daddy's Girl” in white on the green nose. Then we have P-51D-10-NA, WD-D, flown by Capt. Ted Lines of the 335th FS, 4th FG, Debden, England 1944. Same over-all colour and A/G panel as above, red spinner and nose with nose art “Thunder bird”, a Navaho Indian God, starboard side just behind the exhausts. This aircraft has black and white D-day stripes on the lower half of fuselage. Lastly, P-51K-10-NT, S/N 44-12017, flown by Lt. Col. Bill Dunham, Deputy CO, 348th FG, Le Shima, Okinawa, August 1945. Bare metal and OD A/G, red/yellow/blue/black spinner, “Mrs Bonnie” in black with red shadow under exhausts, same colours as spinner on fin/rudder, two thick black stripes on the fuselage and three of the same above and below each wing. National markings are a very pale blue. I can't attest to the accuracy of these decals but they give plenty of references so I feel sure they are close. Apart from the slightly over-done stencils, the rest look very good with perfect register, minimum carrier film and good colour density.